Grantham & Newark Sunbeds are the areas premier sunbed rental company. Where as other companies come and go Grantham & Newark Sunbeds are here to stay. Why are we still here you may ask... Well that's easy to answer, Its because our customers always come back to us year after year. We provide a good range of beds to cover all tastes. We regularly retube our beds to ensure you get a great Golden Tan, and we use the best tubes avaliable!! If the beds are not retubed on a regular basis they are a lot less effective. You can not tell how good a sunbed tube is just by looking at it, you need a UVA Meter and we check all our beds regularly. We only rent out beds in the Grantham, Newark and Sleaford Areas (and surrounding villages). Please note our single canopy beds need to used with a regular bed. We recommend you use a full sized bed single or double some camp beds can be too low for effective use. 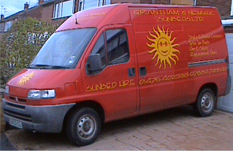 Grantham and Newark Sunbeds constantly check the various sunbed manufactures to find the best quality beds for our domestic sales range (as well as for our hire fleet). 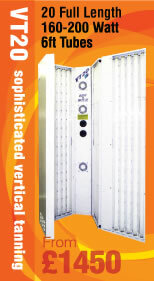 We only sell top quality, very reliable sunbeds. And because we shop around for you we make sure you get the value for money possible. We specialise in the domestic sales market and have an extensive range of beds suitable for home use. So whether you are after the latest style single canopy or the top of the range vertical tanning unit we have the bed for you. If it's a commercial bed your after then please contact us with your requirements. We have access to some fantastic beds with very high performance, low maintenance and a very reasonable price just what you need to make your salon profitable. 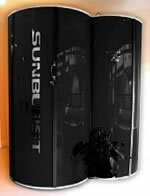 We have slashed the price of our last remaining Sunburst 200watt bed for sale, time to get yourself a bargin! This bed is in fantastic condition and has had very limited use since new. The black finish on this bed gives it a very sleek and professional look. Also includes a built on changing area and token box.